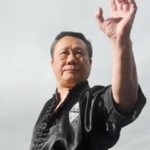 Buck Sam Kong’s earliest training in Hong Kong came from his mother, who practiced the Eagle Claw style of Kung Fu. When he was 6, she placed him in a school that taught the Tam Tuei system. 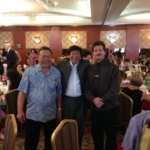 Two years later, Kong met Lam Cho, one of Hong Kong’s leading instructors in Hung Gar(Tiger-Crane) Kung Fu. Lam Cho becomes his primary instructor. When he was 12, Kong also started training in the Choy Li Fut system. In 1956, Kong moved to Hawaii with his parents. He completed high school, became a naturalized citizen and served in the U.S. Army. From 1961 to 1963, he was a hand to hand combat instructor for his division in Korea. Kong returned to civilian life and at the urging of his friends, which included several local Karate and Aikido instructors, began to teach Kung Fu openly. In those days, Kung Fu was only taught to those of Chinese ancestry. In October 1963, Sifu Kong and his friends opened our first training hall near Kam IV Road and Rose Street in Kalihi. In 1974, Buck Sam Kong was inducted into Black Belt Magazine’s Hall Of Fame as Kung Fu Instructor Of The Year. Kong taught in Hawaii until 1976, when he decided to expand his school. In December, Sifu Kong, his wife Nancy and their 3 children moved to Los Angeles. He has lived and taught there for the past 30 years. A grandparent, he has several branches across the mainland, Mexico and Germany. 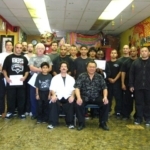 Shifu Marquez learned from Master Buck Sam Kong from 1983 to now and Master Kong has been to the Shaolin Temple to do workshops over the many years.